Poopy Claws is a short, sweet, gross, funny, all-ages graphic novel about a boy and his best friend, a cat named Stinky. Stinky doesn’t use his litter box or doesn’t clean his paws. The boy's mom is a bit of a clean freak. And the mom’s overbearing aunt is coming for dinner. WARNING: Contains a fun, all-ages story. About Cat Poop. Poopy Claws submitted by SBNB on July 22, 2014, 9:48pm It's different and cute. 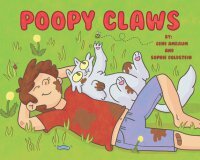 Poopy Claws submitted by Diahann on July 22, 2015, 10:21pm This book takes a slight twist between funny and real. This seems like a story one of your friends would tell you, making the book real funny.